The Tesla Model X is designed to be the safest SUV ever made. With an abundance of features, the ride is incredibly smooth and joyful – that is until the joy leaves when you’re pulled over for not having a front license plate. Did you know there are 31 states that require a front license plate to be displayed on your vehicle? Avoid up to $200 in fines in states where license plates are required to be displayed on the front of your Tesla. If you drive a Model X – you might not care about the cost of the ticket – but you do care about the inconvenience of being stopped especially when you have a vehicle full of people! When you purchased the Model X – you had safety at the forefront of your mind, so why not add even more appeal to this high-tech vehicle with a front license plate bracket? 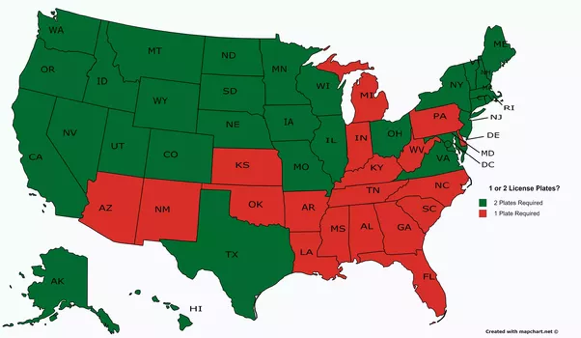 There are 31 states that require a front license plate to be displayed on vehicles (map shown below). Instead of taking a risk of getting pulled over every time you drive, The Law license plate bracket for the Model X helps you avoid up to $200 in fines in states where license plates are required to be displayed on the front of your vehicle. Tesla gives you the option of not installing a front license plate or installing one by drilling three holes into the nose cone. Not only does this permanently modify the body of your vehicle, it can also potentially reduce the resale value of the car. The Tesla Model X is touted for its high-tech parking and proximity sensors and Auto Pilot technology. Don’t install products that would interfere with these perks. Our Law removable front license plate bracket is fully compatible with Tesla’s Auto Pilot functionality and all Model X vehicles. Mountable in the factory honeycomb grill of your Model X, The Law can be positioned on whichever side of your vehicle you choose. Whether you’re looking to add a stylistic touch to your Model X, or just need to display your front plate long enough to get to the next car show, The Law has you covered.